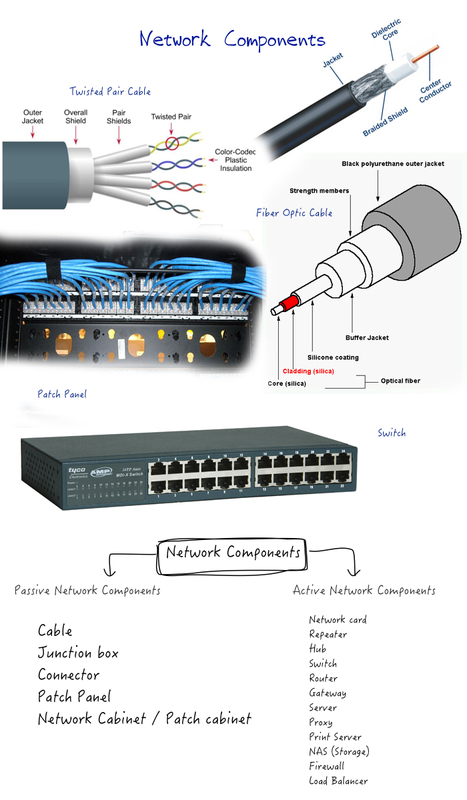 In the network technology, a distinction between active and passive network components. Network components are needed to create a network. These basic discussions via our website is a typical character and we find that the common users find them very much useful. Not that all the readers have theoretical knowledge on computer networking, eventually gross idea about networking comes in usage for works even around the servers or home. Network Components has other names but we will stick with this nomenclature. We are discussing the topic under two sub-headers – Passive Network Components and Active Network Components. We will be linking to the old articles for each components wherever applicable. Cable – Which can include Twisted pair cable, Coaxial cable, Fiber-optic cable, hybrid fibre-coaxial cables. Junction box – It is a container for connections intended to conceal them from sight and deter tampering. Connector – Connectors has been discussed separately. There can be specific type of connectors like fiber optic connectors. Patch Panel – They are used for connecting and routing for monitoring, interconnecting, and testing circuits in a convenient and flexible manner. Network Cabinet / Patch cabinet – This falls among cable management, cable management is an important in information technology and communication. Most topic has been discussed. Remaining is mainly repeater. A repeater is a device that receives a signal and retransmits it at a higher level or higher power or to the other side of an obstruction so that the signal can cover longer distances. There are different types of repeaters and it is difficult to write an article on repeater itself – that is outside the capability of this website. This Article Has Been Shared 1995 Times! Understanding the Basics of Why SIM Card Clone is Impossible Demands Good Knowledge About Networking & Embedded Systems. Scam runs to fool. Enterprise Resource Planning or ERP is the entrepreneurial task in nature within an existing company resources for re-allotment resources together. Cite this article as: Abhishek Ghosh, "Network Components : Basics," in The Customize Windows, April 2, 2015, April 23, 2019, https://thecustomizewindows.com/2015/04/network-components-basics/.